Zion-Irving Lutheran Church celebrated its centennial on Sunday with a packed Sunday morning worship service attended by Bishop Jon Anderson, with a noon lunch that served over 250 current and former members, and with an afternoon program for the public that again packed the church. The former Bonnie Vegdahl said she felt compelled to speak about Zion to explain "how much the church means to me." From childhood memories to praying at the church when her grandfather was sick, "There's no better place to get a solid foundation in faith than this church," she said. "I will praise the Lord to the day I die that I was part of this church growing up." Current and former members packed Zion-Irving Lutheran Church for its centennial celebration over the weekend. A songfest was held on Saturday night; and a worship service, catered lunch, and centennial program were held on Sunday. 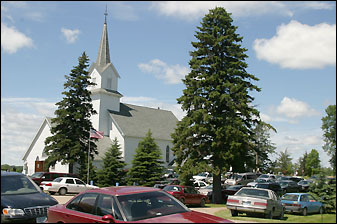 Other former members spoke of additional memories, including humorous stories such as a man saying his brother knew how many ceiling tiles the church had to another recounting how the pastor seemlessly included the church's exact location (two miles south and a mile east of Hawick) during a prayer so "God got the right Zion Church." Zion-Irving Lutheran Church - originally Zion Norsk Lutherst Menighed - was founded in 1905, and the church was built the same year in Irving Township. 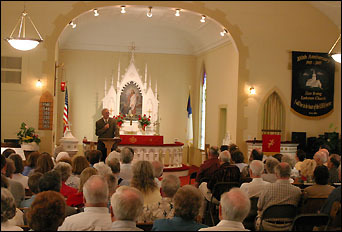 Through most of its history, the parish has shared ministers with other churches. Since 1976, it has shared ministers with Harrison Community Presbyterian Church. Three former pastors attended the centennial celebration on Sunday. Fred Soberg, who served from 1976 to 1987, said he felt like a perfect fit for Zion and Harrison with his background in a lutheran seminary and a presbyterian church. Zion-Irving has "so many people of tremendous faith," he said. Paster Fred Soberg, who served at Zion-Irving Lutheran Church from 1976-1987, addressed the capacity crowd at the church's centennial service on Sunday afternoon. Former pasters and current and former parishioners shared memories of the church throughout the weekend. And Palmer Sevig, who served from 1987 until retiring in 1992, quoted Phillipians 2:13 - "For God is at work with you" - in complementing the small church on its ministry. On a lighter note, he complimented the church on its building: built in 1905, basement added in 1915, and narthex added in the 1990s. "I felt like I was in heaven when I went in the basement last night compared to what it was like when I was here," he said. A songfest was held at Zion on Saturday night, along with Sunday's festivities. The centennial committee at Zion-Irving Lutheran Church - which organized the weekend activities as well as the commemorative plates, ornaments, cookbooks, and history books - was comprised by Jane Herem, church secretary Angie Jones, Jay Liedman (who wrote the 200-page history book), Carol Otteson, Cheryl Prentice, Kim Prentice, church president Bob Salonek, and Hazel Vegdahl.